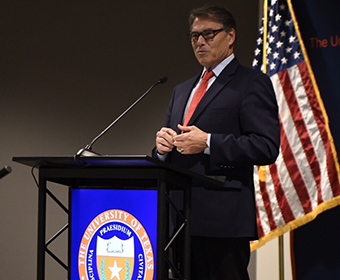 (Oct. 19, 2018) -- Government, university and industry leaders gathered at the UTSA Downtown Campus today to advance the partnerships that position San Antonio as a test bed for energy cybersecurity preparedness. The 2018 South Texas Energy Cybersecurity Forum brought together top leaders from across San Antonio, Texas, the military and intelligence communities, and the private sector. University of Texas System Regent Rad Weaver introduced UTSA President Taylor Eighmy, who delivered opening remarks at the meeting. U.S. Department of Energy Secretary Rick Perry delivered the keynote address. Participants at the invitation-only meeting discussed the expertise, strategies and resources available amongst the group to safeguard regional and national energy systems. 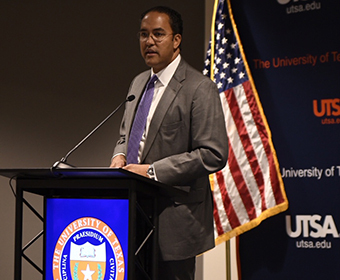 The discussion was built upon UTSA’s robust knowledge enterprise in cyber, cloud, computing, analytics and data as well as its plans for a National Security Collaboration Center and a new School of Data Science. San Antonio is the nation’s second-largest cybersecurity hub outside of Washington, D.C. The city’s cybersecurity ecosystem includes more than 80 companies, various colleges and universities and military components such as the 24th Air Force, 25th Air Force, 67th Cyberspace Wing, 688th Cyberspace Wing, FBI Cyber Division and National Security Agency. The city is also home to CPS Energy, the nation’s largest, municipally owned energy company, and a wide array of oil and gas companies including corporate offices and small and mid-sized companies focused on downstream, midstream and up-stream operations. To explore the opportunities and challenges related to energy cybersecurity, the event included a panel discussion with Steve Ashby, director, Pacific Northwest National Laboratory; Zachary Tudor, associate laboratory director of National and Homeland Security, Idaho National Laboratory; Heidi Ammerlahn, director of Homeland Security and Defense Systems, Sandia National Laboratories; Paula Gold Williams, CEO of CPS Energy; Nicole Beebe, director of the UTSA Cyber Center for Security and Analytics; and Greg White, director of the UTSA Center for Infrastructure Assurance and Security. Hurd moderated the panel.